traction opposed to traction; used in reduction of fractures. The resistance, or back-pull, made to traction or pulling on a limb; for example, in the case of traction made on the leg, countertraction may be effected by raising the foot of the bed so that the weight of the body pulls against the weight attached to the limb. /coun·ter·trac·tion/ (-trak″shun) traction opposed to another traction; used in reduction of fractures. a force that counteracts the pull of traction, such as the force of body weight resulting from the pull of gravity. Orthopedic countertraction may be obtained by altering the angle of the body-weight force in relation to the pull of traction, such as by elevating the foot of the bed with blocks to attain the Trendelenburg position. 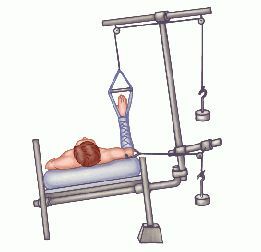 The magnitude of countertraction is usually increased gradually by methodically changing the position of a patient and by adding or removing weights from weight hangers. The resistance, or back-pull, made to traction or pulling on a limb; e.g., in the case of traction made on the leg, countertraction may be effected by raising the foot of the bed so that the weight of the body pulls against the weight attached to the limb. A pull in one direction so as to allow the full effect of a simultaneous pull in the opposite direction. Countertraction is often applied to a fractured limb undergoing surgical straightening (reduction of fracture) or sustained TRACTION for purposes of immobilization. In this way, you create traction and countertraction, sweeping the tissue out of your way. 2014 (21) gruppo sperimentale Dolore: VAS ROM: non (n=50): specificato se mobilizzazioni attivo in FLS e ABD passive con Disabilita OSS countertraction + impacco caldo + ultrasuoni e diatermia + esercizi di stretching a casa gruppo controllo (n=50): lo stesso protocollo senza applicare la trazione alla mobilizzazione NT: 5 giorni a settimana per 2 settimane = 10 Russel et al. He or she must know not only how to turn the uterus for vessel coagulation and visualization of anatomy, but also the nuances of traction and countertraction for dissection and the colpotomy. The guide also enables countertraction to create more working area within the abdomen, and provides a better approximation of tissue. The time-tested surgical adage of traction and countertraction is just as applicable in robot-assisted surgery. To cut effectively with a conventional # 15 scalpel blade, the surgeon needs a taut surface, which is usually created by traction and countertraction provided by the surgeon and the assistant. Intraperitoneal space is required during myomectomy because of the need to apply traction and countertraction during enucleation of fibroids. The third quarter would be dedicated to acquiring specific surgical skills - knowing the boundaries of pelvic spaces and using techniques such as hydrodissection and traction / countertraction, for instance, as well as performing laparoscopic suturing and using agents for adhesion prevention. Using conscious sedation (100 mg of IV fentanyl and 4 mg of IV Versed[R]), the right posterior hip dislocation was reduced first with gentle traction and countertraction with both the hip and knee in 90[degrees] of flexion. Countertraction is provided during placement by having a surgical assistant retract the mucoperichondrial flap laterally with a tiny double-pronged hook. For adhesiolysis, traction and countertraction are the techniques of choice. The assistant can provide countertraction with a tonsil clamp or DeBakey forceps.